We built a “new” coil by removing windings from the test coil until it had 56 turns remaining. It was re-installed back into the same iron core again. However, using this coil at full power (160 volts) resulted in sparks and a small spray of molten metal and (of course) a weak launch. Disassembly found that the coil was shorting across the transformer core. The magnet wire’s varnish has evidently worn through during the several times it was dismounted and re-installed. Now we are reminded why transformers are built with plenty of oil-impregnated paper. It protects and insulates the thin varnish coating from the sharp edges of the stamped iron core. Curiously, the sparking was not a problem at lower voltages. We ran many shots using 10 – 150 volts without a problem. It was only at full power that shorting occurred. 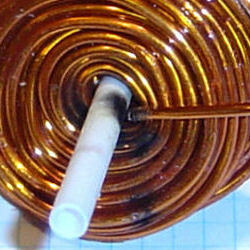 The photo below shows black marks along the tube, pitted copper wire where it enters the coil, and pitted copper again near the bottom of the coil. The opposite side of the coil has another similar burn mark. 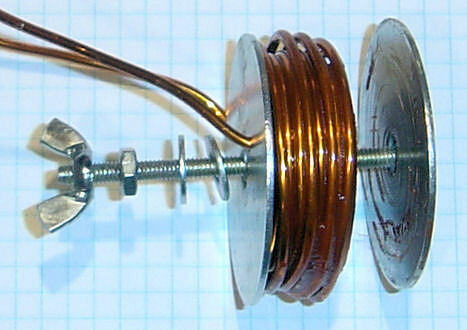 A new coil was built from fresh magnet wire. We applied more Glyptal insulating varnish than on the first coil to better protect the wire. 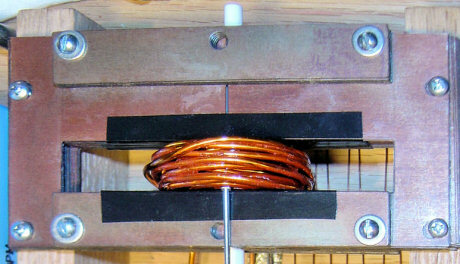 The new coil in its winding jig during construction is shown below. We also applied high quality electrical tape to the iron to mask the sharp corners. The installed 56-turn coil #2 assembly is shown in the photo below.